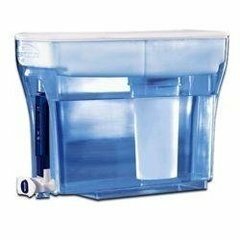 The best cheap water filter removes unhealthy water contaminants, is durable and easy to use, and costs $40 or less. If you are reading this, you most likely want cleaner and better tasting water than what you are getting from your tap or well. And if you’ve done any research, you know that just about any water filter system is going to be much cheaper (over the life of the system) than buying bottled water. Not to mention the fact that nearly half of all bottled water is no better than tap water, and the environmental impact of plastic bottle waste is significant. The criteria we are using to determine the best inexpensive water filters is the initial cost, filtration quality, replacement filter expense, filter capacity, ease of use, and durability. There are many types of home water filters to choose from, ranging in price from about $15 to several thousand for whole house systems. The benefits and convenience of whole house systems are obvious, but they generally cost $500 or more. Under counter and counter top water filters are also convenient and offer the highest quality filtration, but they also cost well above $40. Thus, we are focusing our recommendations on the water filters that cost $40 or less. These include the faucet-mounted filters and the pour through water filter pitchers and dispensers. It helps to know what is in tap water or well water in your area before buying a water filter from your local water utility company or health department. Most basic water filters will remove sediment and chlorine, and improve odor and taste. The best water filters will also remove other contaminants such as heavy metals. We look for third-party certifications for water filters, such as NSF certifications or Water Quality Association certifications. Otherwise, you never really know the degree of filtration you will get. How often filters need to be changed and how much replacement filters cost should be a primary consideration. Most filters for faucet and pitchers need to be replace for 40 to 100 gallons of water, up to 4 months for the average family of 4. Most water filters have some type of indicator to let you know when you need to replace the filter. You can also save money by buying more than one replacement filter at a time. The capacity you need depends on the number of people in your home who will be drinking the water. Faucet-mount filters provide unlimited capacity and filtered water instantly from the tap. The pour-through water filters, such as the pitchers and dispensers, take a little time to filter. Thus, if you need large capacity of drinking water, a water pitcher is not going to suit you. The water dispenser we recommend provides 23-cup capacity. Even cheap water filters should last for years if installed properly and properly cared for. The water pitchers and dispensers should be hand washed and filters replaced regularly. The Culligan faucet-mount filter seems to be the most durable of its type on the market. Hot water (100 degrees F.) with any type of water system can damage the filtration media. The following are our top picks that meet the criteria above, one for each type of cheap water filter: faucet mount, dispenser, and pitcher. Please note: The drinking water systems that offer the highest degree of filtration are going to be the under sink and counter top water systems. Thus, if you are willing to pay more than $40 for better filtration, then we recommend you check out our reviews for Under Sink Water Filters and Countertop Water Filters. Cheapism.com; Best Cheap Water Filters; 2016. If you would like to reproduce or republish this article or any other article on this site, feel free to do so but please include a reference or link to the article at WaterBenefitsHealth.com.